Online shopping is great: there’s no rushing around before the store closes, no dragging bulky items home - no changing out of your pyjamas even, if that’s the mood you’re in. 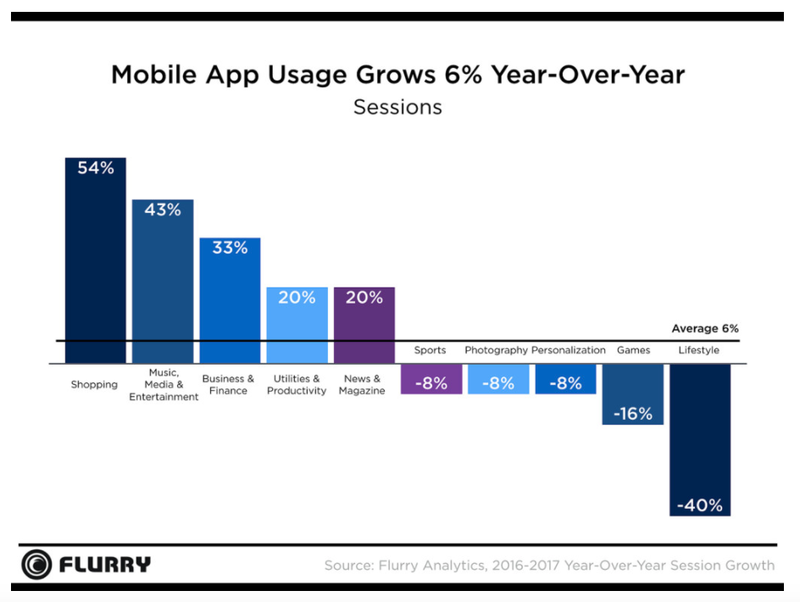 There are plenty of reasons why shopping on the internet - and shopping via mobile apps in particular - is continuing to show impressive growth, even above other verticals on mobile. If you’re in the retail business, that’s not likely to be news to you. Almost any retailer who is achieving success today has a digital strategy that involves a mobile app. What’s also unlikely to be news to you is the fact that, despite the time consumers are spending in retail apps, the majority of transactions are still being made in store. Although a huge $400 billion was spent online in 2016, that’s a small percentage of the $3.4 trillion that was generated in total retail sales, and the remainder of that total was spent offline. At first glance, that just doesn’t seem to add up. But the missing link is this: $1.37 trillion of that revenue comes from customers who browse and make decisions about their purchase online, but complete the transaction in store. What all these statistics are showing is that customers are engaging in a truly multichannel way, using various platforms even during a single purchase - and what that really shows is that the experience you offer in your app can be used to drive revenue in store. It’s all very well saying this in theory, but what any marketer really wants is cold, hard evidence that an approach works before time, money and resources are spent developing a strategy based on it. Well, we’re happy to oblige. One of Swrve’s own customers recently ran a successful campaign that delivered ‘digital flyers’ within the app in order to attract more customers to visit bricks-and-mortar stores. As you’ll see below from the data gathered in collaboration with Plot Projects, the results were dramatic. This data shows just how effective this online-to-offline approach can be, and their multi-platform approach to conversion is a great example of how forward-thinking retailers are embracing the new cross-platform way of shopping. A leading retail app that works with Swrve regularly uses in-app messaging to promote in-store purchases. To demonstrate the impact that these communications were having, some of the app’s users were shown a digital flyer advertising a particular store, and others were not, to act as a control group. The app then recorded when both sets of users visited the relevant stores, and compared the two groups. Let’s look at three main takeaways from this data. 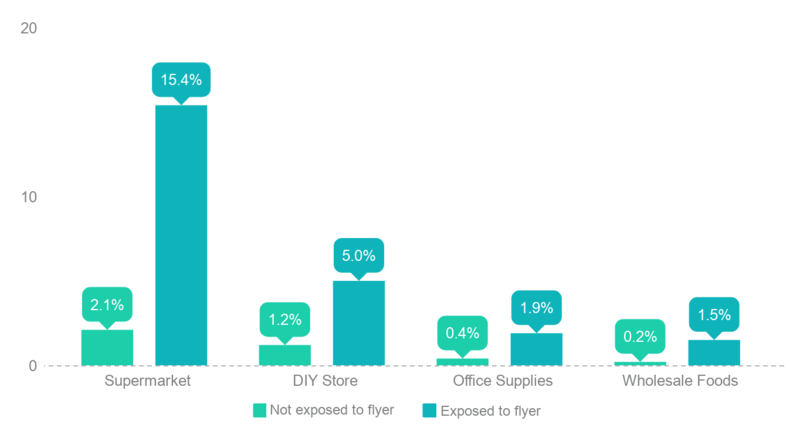 The groups that were exposed to the flyer showed increases in store visitation rates across all sectors of retail that were tested. What’s more, those rates increased by significant amounts - the percentage increased by over 700% in both supermarkets and wholesale foods. This data is a simple but really effective way to show the impact that online experiences can have on offline experiences, and how an interconnected approach to digital and physical retail can pay off. The in-app flyers that these users were shown weren’t just effective - they were really effective. So how do in-app promotions like these manage to boost store visits by up to 7 times? Virtual flyers like those used in this case study can encourage users to visit a store by showing the route to the nearest location, giving a discount, or reminding users of a product on their wishlist. Apps provide the perfect platform for to distribute them, thanks to the frequency of use and the accuracy possible in the messaging. Depending on which report you read, estimates suggest that we check our phones over 100 times a day, so anything that appears on our screens is likely to get seen. Through geolocation, behaviour data and dynamic, customizable messages, apps allow you to target messages to those users who are actually likely to be interested in them, and make it less likely to result in a negative customer experience for those who aren’t. It’s worth noticing that the metric being targeted here isn’t in-app conversion or click-thru rate. With Forrester predictions suggesting that 40% of in-store transactions will be influenced or determined by digital by 2021, the fact is that the number of purchases made in the app might well not reflect the real number of purchases made as a result of the app. Instead, this retail app focused on connecting the digital and physical worlds of retail as their metric for success. Using geolocation, this app was able to register when users visited the relevant stores - making sure not to include those who stayed for either particularly long or short periods of time, as these were likely to be either employees in the store or passers by. Since most transactions are completed in-store, particularly after engaging online, measuring the number of users who visit the store as a result of app engagement can be a valuable metric, as increased store traffic almost always leads to increased revenue.